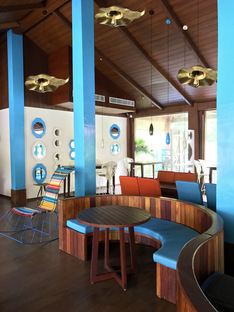 The designers Sahil Bagga and Sarthak Sengupta, known as Sahil & Sarthak, have designed the interiors of the restaurant in the SilverSand Havelock Resort on Havelock Island in the Andaman Islands, based on their ethnic, ethical and eco-friendly approach to interior design. Havelock Island has beautiful white sandy beaches protected by coral reefs and is part of the Andaman Islands. The Andaman Islands form a tropical archipelago with more than 600 islands (only 36 inhabited), located 1000 km off the east coast of India in the Gulf of Bengal, most of which is politically part of India but geographically located in South-East Asia. In other words, a true earthly paradise which is exactly why it has a highly delicate ecosystem. All the more reason for the Indian designers Sahil & Sarthak to follow their tried and tested approach, ASAP - “as sustainable as possible” - for their interior design remake of the restaurant and bar at the SilverSand Havelock Resort. So, Sahil Bagga and Sarthak Sengupta proposed, as we saw in their Lakshman Sagar Resort project in Rajastan design solutions using eco-friendly materials and sustainable manufacturing processes. The interiors are influenced by the colonial style architecture of Ross Island, once considered to be the "Paris of the East" for its exciting social life, but they are also informed by the region's flora and fauna and maritime culture. So, they have gone with wood and the colours of the sea for their concept, and the most significant representation of this idea are the bespoke-designed quirky bar stools with stingray backrests in the Sting Ray Bar. Other elements of the underwater theme are the jelly fish pendant lamps and coral inspired drop lights and lamps. The interior design crafted by Sahil & Sarthak in the SilverSand Havelock Resort is in full harmony with the location and its traditions, thanks to the desire of the designers to craft extremely aesthetically appealing solutions with the lowest possible impact on the environment.